Ottawa, Ont. – (BasketballBuzz) – After coming up short on many occasions the Carleton Ravens finally got a signature win against one of the top dogs of NCAA collegiate basketball. Fourth-year point guard Philip Scrubb (Vancouver, B.C) put together arguably his best performance in a Ravens uniform and perhaps in the history of the team by shredding the Wisconsin Badgers (B1G Ten) defense for a game-high 30 points and 12 assists, while senior forward Tyson Hinz (Ottawa, Ont.) added his third straight double-double of the preseason with 25 points and 10 rebounds as the Carleton Ravens defeated the Wisconsin Badgers 95-82 in-front of a sold-out, standing room only crowd at Ravens Nest earning their third straight victory over NCAA Division I team. The Ravens rod a hot start and used a 12-0 run late in the first-half to grab a 51-36 half-time lead, largely due to the hot shooting of both Hinz (18 points, 4 rebounds) and Scrubb (15 points, 8 assists) who combined for 33 of the Carleton’s 51 first-half points. Sophomore Sam Decker (Sheboygan, WI) carried the Badgers offensively with an impressive second-half (21 points) performance and finished with 28 points and seven rebounds, connecting on 9-of-13 shots and 4-of-6 triples. Point guard Traevon Jackson kept the Carleton fans entertained with his 19-point effort, which included some jaw dropping crossovers to free him up for open jumpers. Scrubb shot 12-for-21 from floor, nailed 3-of-6 from the outside and was a perfect 3-for-3 the foul line, while playing the entire 40 minutes. According to assistant head coach Rob Smart (9th season) this was Scrubb’s best game in his four-years with the team. Badgers leading scorer (15 PPG/2012-13), senior guard Ben Brust was limited to just 4 points on 2-of-8 from the floor. Legendary Head Coach Bo Ryan who kicked off his 30th season on the sideline, (13th with the Badgers) and his staff also knew they would be in tough against Carleton. “Oh yeah we knew they were good players” referring to Scrubb and Hinz. Scrubb nickled and dimed, continuously exploited the Badgers inability to guard their patented pick and roll offensive sets by making the right decisions almost everytime, either knocking down the open jumper, when UW guards went underneath the screens or finding open team-mates for wide open shots and layups underneath. “I’m pretty comfortable with the sets we run and I know the reads that are there and we have plenty of guys that can hit shots and finish inside, so I don’t have to make a great play, I just gotta move the ball.” discussed Scrubb in our post game interview. The Ravens shot 53.6% from the field and only turned the ball over six times to hang on to a signature victory that will surely will rank at the top of the programs list, specially after several close margins of defeat against the creme de la creme of Americas finest collegiate basketball institutions. Carleton who is in pursuit of their tenth Canadian University National championship have dropped close decisions against the Louisville Cardinals 66-67 in 2006, Kansas Jayhawks 83-84 in 2008 and most recently against UNLV 70-74 in 2012. Ravens (3-0) will wrap-up the NCAA preseason portion of the schedule against the 2013 NCAA finalists Syracuse Orange on Friday. The highly anticipated match-up will showcase two of Canada’s premier point guards as Syracuse freshmen Tyler Ennis will take on two-time CIS Men’s Basketball Player of the Year Philip Scrubb at the home of NHL’s Ottawa Senators and site of the upcoming 2014 CIS Men’s Final 8 National Championships. The Badgers (0-1) will continue their week long trip to Canada with date against the Ottawa Gee-Gees who took down TCU Horned Frogs in the opener before heading down the 401 for a trip against the Ryerson Rams. 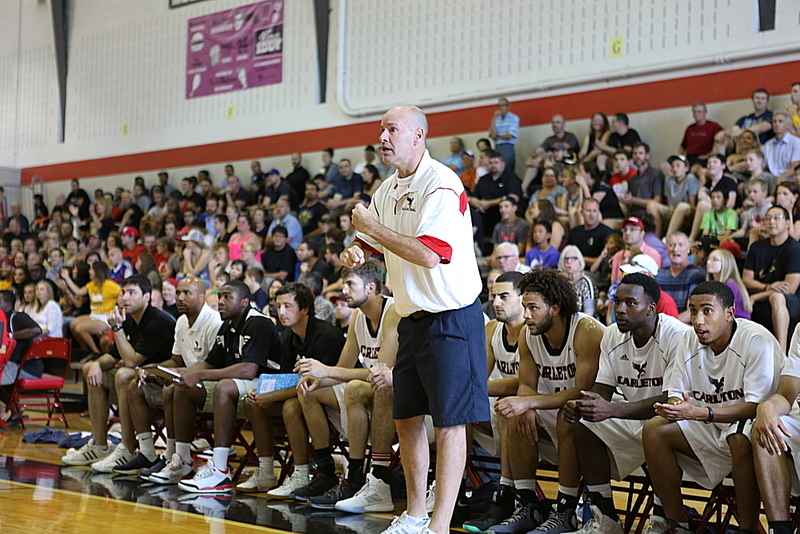 Carleton played the game without Head Coach Dave Smart (15th Year) who is currently in Puerto Rico with the Canadian Senior Men’s National Team.